Saakashvili Goes To Poland, But How? WARSAW, Poland -- Mikheil Saakashvili has long had a reputation for pulling off the unexpected, and, this time, he’s done it again, with a trip from the US to Poland shortly after having lost his Ukrainian citizenship, his only form of citizenship and the basis for his passport. The former Georgian president made the trip to take part in anniversary ceremonies for the August 4, 1944 uprising in Warsaw against Nazi Germany. The question is, though, how he came to Poland. 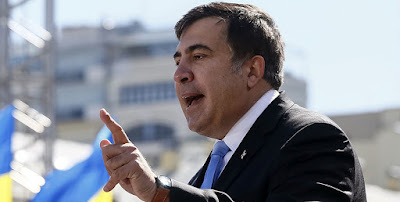 In an interview with Ukraine’s 24 Kanal news channel late on August 4, Saakashvili stated that he traveled with his Ukrainian passport. “I flew out of America, I went through passport control like usual, I flew to Poland like usual . . .They put a stamp [in my passport. ],” he said, adding that no one will fulfill the “dictatorial whims” of Ukrainian President Petro Poroshenko. Poroshenko, his onetime friend, revoked Saakashvili’s citizenship on July 26. The Ukrainian government claims that the ex-Georgian president, who has reinvented himself as an opposition politician in Ukraine, had not disclosed that he was under investigation in Georgia when he applied for Ukrainian citizenship. Saakashvili, an outspoken Poroshenko critic, has denounced the claims as a thinly veiled attempt to push him out of Ukraine. He plans to appeal the decision in a Ukrainian court. In the meantime, he apparently plans to keep on traveling. He told 24 Kanal that he intends to “travel around to other European countries” after his stay in Poland, and will return to Ukraine for the start of his court appeal. Neither Saakashvili nor his spokesperson could be reached to elaborate about his trip from the US to Poland. US Customs and Border Protection did not immediately respond to a request for explanation about travel procedures for stateless persons. Polish border officials also could not be reached for comment. Saakashvili's trip to Poland is cause for head-scratching. Stateless persons cannot travel without some form of valid travel document. The US is not a signatory of the 1954 UN Convention Relating to the Status of Stateless Persons, which requires signatories to issue such documents for stateless individuals "lawfully staying in their territory." It is not known whether Saakashvili petitioned the US to issue him such a document. He has stated that he would not request asylum in the US, however. What is known, though, is that the Georgian government, allied with Ukraine in a pushback against Russia's territorial encroachments, will follow Saakashvili's ongoing travels with interest. It has vowed to have the former Georgian president extradited back to Georgia to face outstanding criminal charges, and already has asked Poland “to take measures against” him.